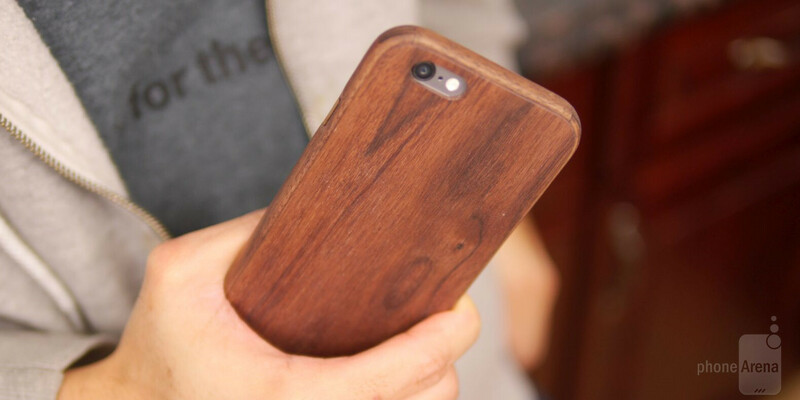 Wood, it’s the new “premium” material we’re seeing more being used by smartphones. Of course, there’s no wood finish option for the iPhone 6, but the next best thing, obviously, is to pick up a case that brings in that natural material to the beloved smartphone. If you’re looking for something more true and authentic, the Grovemade case is sure to attract because it’s made entirely from domestic hardwoods – Oregon Claro Walnut to be exact. First and foremost, the Grovemade case is constructed entirely out of this material, which requires some precision CNC milling machinery to meticulously perfect. It undeniably sports that hardwood finish, giving it a pretty sturdy feel – plus, it’s not all that bulky either. In fact, it adds very little heft to the iPhone 6’s already established svelte construction. Checking it out, we instantly notice that a lot of attention was made into manufacturing this case – more so when looking at its precision-crafted corner joints. Now, the Grovemade Case is comprised of two components. First, there’s the outer bumper frame that wraps around the sides of the phone. Thankfully, the lasercut actuated walnut power and volume buttons retain their springy response. However, in order to completely cover the iPhone 6, the one piece 0.07-inch thick back plate is attached to the phone via an adhesive material lining the one side of the back plate. We’re really not fans of having this, just because it means that once it’s on, it’s not really meant to be removed. If you’re wondering, the back plate can be removed with enough pulling and pressure – very slowly, though. The good news is that the adhesive doesn’t leave any residue on the phone, but the manufacturer claims that it’s not the kind of thing that’s meant to be removed repeatedly. From a cursory inspection, the adhesive seems intact after removing it, but who knows how many more times it’ll be able to maintain its adhesive quality. This one doesn’t come cheap, especially when you factor in the hardwood material it’s employing and the precision crafting it requires to produce. Frankly, the $99 cost will certainly prevent it from gaining mass adoption from consumers, but for those iPhone 6 owners who want to stand out from the usual plastic, bulky, and generic styles, the Grovemade Case won’t disappoint – just be ready to commit to this case for a long, long time.